First of all, let me say that any books with Greek mythology are a must read and usually a favorite of mine. I was unsure about this book at first because of the Hercules-type storyline, but upon reading it, I was blown away. I wish this had been around when I was a kid, because I would have really enjoyed it then. The humor spans all generations, it has action, and it has a good plot line and the pace is set at a decent speed. I chose to read this before seeing the movie, and had to finish all five books once I got started. 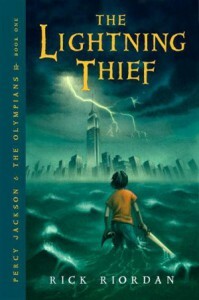 Riordan definitely can write an enthralling tale, one that attracts both kids and teenagers. I was thoroughly impressed, especially by the accuracy of the mythology he used (though some was tweaked for the purpose of the story, which is understandable).